Before match start, ring announcer, Shindoh, explained as this is Anywhere Fall Street Fight style, with no holds barred except things really dangerous. Kenny entered first. Then Takagi. Both shook hands and match started. Lockups – break – lockups – Takagi takes back – Kenny’s necklock – Takagi’s necklock. This was the first moves they had. Then Takagi’s shoulder through to armlock to Kenny but Kenny kicked Takagi’s head. Then Kenny’s lockup, Takagi’s headlock, Kenny threw Takagi to the ropes and jumped over Takagi by leapflog, then Takagi fell onto the floor. Referee Matsui describes this leapfrog was the highest leapfrog he has ever seen in his 15 years of referee career. Takagi drag Kenny to Southside bleechers and bodyslamed to cover – count 2. Then clothline to Kenny but also count 2. Then Takagi screamed “Go to Jusco! (Jusco is a name of Japanese supermarket)” and drag him to outside. They punched several times in front of vending area then Takagi screamed “Go to Shinkiba Station! (nearest train station to the venue)” and drag Kenny out to street. Takagi kicked Kenny, Kenny screamed “Michinoku Driver!” but Takagi blocked. Double Axe handle by Takagi from the topof guardrail, then brawl on the street. Kenny’s moonsalt from the top of guardrail. Then Kenny tried to go back to the ring with screaming “Back to Ring!” but Takagi denied :Go to Station!”. On their way back to the ring, Takagi delivered Diving Knee Drop from the top of DDT’s van. Kenny escaped left leg to the rear bumper, referee Matsui approved this was “escape”. Then moved back to vending area and Kenny bodyslammed Takagi, place a table on him, and footstamped. Count 2. They went back to the ramp. Kenny lay Takagi onto the table and delivered diving body press to Takagi. Count 2. Then went back to the ring, Kenny’s flying forearm from the rope, and facecrusher to Takagi. Count 2. Several back-and-forth at apron, then Takagi tried to deliver Thunderfire power bomb but Kenny escaped. Kenny caught Takagi and tried to fall by schoolboy. Count 2. Then after delivered Stop! Enzuigiri, Takagi escaped out of the ring. 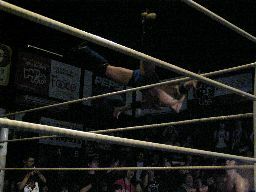 Then Kenny’s Tope Con Hilo over the top rope to Takagi. This time he landed on the table and broke into pieces. Kenny tried to powerbomb Takagi from the top rope but Takagi blocked. Kenny delivered Hadouken and Takagi was blown away down to the ring. Kenny covered but count 2. Then back to the ring, Takagi delivered powerbomb from the top rope and table was broke into pieces again. Takagi delivered Thunderfire Power Bomb but count 2. Then Takagi’s Kamehameha (! ), then Kenny’s Shinku-Hadouken (yes, Shinku-Hadouken this time). Elbow rush from both side, chop rush from both side, then Kenny tried to deliver Electric Chair German Suplex but Takagi escaped. Takagi delivered StoneCold Stunner but count 2. Then Takagi delivered Sitdown Himawari Bomb and finalized the match with count 3. This is the last match for DDT’s Beer Garden event this year. Kenny’s first match in Japan was just one week ago but he is now very much appreciated by DDT fans. Actually, they are C R A Z Y on him right now. As for huge Omega mark, we are so glad everything went well and he obtained popularity in Japan. His next match is vs Masa Takanashi on 8/17. Of course we will report details. *This review is based on Extreme Party. Please visit this page to see more pictures. Looks like another solid, good match. I will update detailed report once available. *”What is King of Stockholm?” I guess many people are wondering like this. They explained like this – “If you say ‘King of Stockholm’ for 10 times as quickly as possible, you can hear like ‘stocking’”. So this Royal Rumble is the one everyone has to wear stockings! Rule is simple – wrestlers enter every 60 seconds, regular Royal Rumble rule with over the top rope. 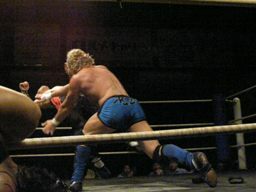 Kenny tried to throw Sasaki out of the ring but Anton interfered. Anton facelock to Kenny. Dieno’s target was Kenny. Kenny blocked Dieno’s Danshoku Claw. Then he decided to deliver Hadouken (as Dieno was too dangerous! ), but Hadouken was relayed one by one and finally hit referee Matsui. Dieno chased Kenny doggedly. Kenny delivered Hadouken but Sakai screamed “it doesn’t work for me!” Kenny was surprised and delivered Sinku-Hadouken. It worked. Everybody hold Sakai onto the mat and count 3. Sakai was eliminated. Dieno still chasing Kenny. Kenny tried to escape from him. Kenny tried to attack Itoh but went out of the ring by shoulder through from Itoh. Kenny was eliminated. 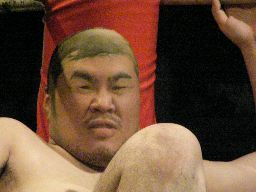 Then, match continued and Sasaki won this Royal Rumble in the end. Since this match was Royal Rumble with wearing stockings on, it was more like comic match. 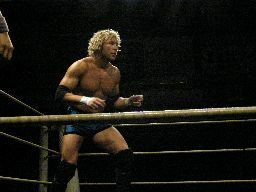 Originally this match was scheduled as Quiet Storm & Kenny Omega vs Choun Shiryu & Kim Nam-Seok. However, Producer of tonight, Yasu Urano announced they he changed the card as he saw in the dressing room that Quiet Storm was very jealous to Kenny for his popularity. So he decided to let them fight. Actually Quiet Storm came to Japan many times but fans cheer Kenny more. Kenny and Quiet Storm got in the ring first and started the match. First moves were like Storm-lockup, Kenny-headlock and taking back, Storm-hammerlock to headlock, Kenny-throwing ropes and leapfrog jumps, Storm-legwhip, Kenny-huracanwhip. Then both touched their partner. Then Choun and Kim wrestled for a while and Kim touched Kenny. Now Kenny on Choun.Kenny-double punch to Choun’s back, backhand chops and dropkick to the back of head. However this is count 2.5. Then Choun on Kim for a while, Choun touched Storm so Storm on Kim for a while. Then Kim touched Kenny. Kenny delivered elbow to both Choun and Storm. 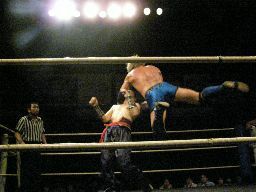 Then flying elbow to Choun. Choun touched Storm. Kenny threw Storm to ropes and gave him bigboots when he comes back. 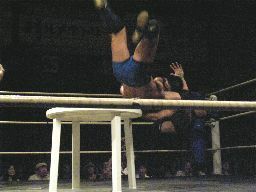 Then delivered Northernlight Suplex but it was count 2. Then Storm screamed “Storm Ichiban! (mean Storm No.1)” and elbow drop. Count 2. Kenny threw Storm to the corner and elbow to the corner. Then cross-legged fisherman’s suplex to Storm but Storm stood on the ring and German Suplex to Kenny. But Kenny backflipped and gave Frankenstiner to Storm and touched Kim. Then Kim on Storm, Kim on Choun for a while. Kenny’s crodd-legged fisherman’s buster to Choun was cut by Storm. Then Kenny did Stop! Enzuigiri and hold Choun on his shoulders and delivered Electric Chair German Suplex. Then delivered Hadouken and count 3! Kenny’s first win in Japan!! After the match, Kenny and Choun respect each others by Chinese bows. People say it was very solid, good match. Also they say Choun’s style fit Kenny very well. As soon as match starts, there was a big Omega call – wait a minute?! This is his 2nd match but how can he be so popular?! Match started with typical ground wrestling moves – lockups, taking backs & necks etc. Then Kenny took Ibushi’s arm but Ibushi escaped. Kenny tried to headlock but Ibushi hold Kenny’s legs and Kenny was down to the ring. Ibushi threw Kenny to the corner and tried to tackle but Kenny dodged by backflip. Then strong elbow rush from both side and Kenny said “Outside!”. This was the start of “out-of-ring” match. They dragged each other and went outside. First of all, kicks & elbows in front of vendors for a while. Then Kenny set a chair and face crushered Ibushi onto the chair, then famous Tony Jaa (running double knee strike with opponents on chair) to Ibushi! Then Kenny gave Michinoku Driver onto chair! Ibushi escaped at count 2. Then Kenny delivered another Michinoku Driver onto a pile of chairs and got 3 counts. So the 1st win went to Kenny. (match time 7:10 by Michinoku Driver on street). Kenny dragged Ibushi and tried to take him to the ring. As I mentioned before, this is irregular 2/3 fall match and must take 1 fall in the ring and 1 fall out of ring to win this match. Once Ibushi stood up, he backdropped Kenny on to chairs. Then Ibushi gave elbow rush. Ibushi gave a low kick but Kenny dodged. Ibushi gave standing Moonsalt on to Kenny who was laid on the street! But this was count 2. Then Ibushi set the table, laid down Kenny onto the table, and climbed up to the vending machine and PHOENIX SPLASH FROM THE TOP OF VENDING MACHINE!!! This was the most insane move during the match. Of course Kenny couldn’t wake up from this crazy move, and Ibushi won this 2nd fall. (match time 9:38 by Phoenix Splash from vending machine). 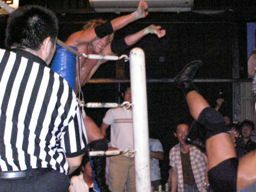 Now the match is tie with 1 – 1 from the ‘out of the ring’, so they went back to the ring for the last 1 fall. Kenny went back to the ring first and delivered Tope Con Hilo dive to Ibushi who was still in the ramp. Both of them went back to the ring, and Kenny gave Ibushi Electric Chair German Suplex. But count 2. Kenny stood on the corner post. Ibushi tried to catch Kenny and finally overhead kick to Kenny. Ibushi tried Brainbuster but Kenny tried to switch to Powerbomb, but Ibushi changed it to Huracanrana. Kenny was laying on the ring then Ibushi did Moonsault & Moonsault! Ibushi hold Kenny from the back and tried to Full Nelson but Kenny blocked. Then Ibushi gave Kenny slaps, low kicks and sobats. Then Kenny did Stop! Enzuigiri, and and Ibushi did Stop! Spin-kick. Then Ibushi gave Dragon Suplex to Kenny but it was count 2. Kenny delivered Hadouken but Ibushi escaped from it. Then Kenny delivered ANOTHER HADOUKEN and striked Ibushi. Wow, double Hadouken!! However, this was count 2. Then cross-legged fisherman’s suplex by Kenny and climbed top rope. But Ibushi followed him and dragon suplex from the top rope! Then Ibushi’s buzzsaw kick rush to Kenny and took the last fall (match time 17:42 by buzzsaw kick rush). Well, some of you may know but Japanese people watch wrestling very quietly (compared to US fans) so they don’t rarely get so excited but this night was exceptional! They were so excited and went nuts. This is because the match was soooo good. We usually run this site in Japanese so I guess most of you can’t read it but we are always saying we are huge mark on Kota Ibushi and Kenny Omega. So this is a dream match for us and that’s one reason why we are working so hard on this Kenny’s Japan tour. Both of them have so many things in common. Physically, they are almost the same size. Both of them are from small promotion. They learned wrestling on their own. They have martial arts background etc. But these are small common points. Most important thing is, both of them have “great potential” and “great charisma” in the ring. I was sure this match was gonna be crazy one (I mean, in a good way) but seems like this one was more than just “crazy”. I hope you guys enjoyed this match review. *This review is based on Extreme Party. Please visit them for more pictures.